We know reading and writing are linked, right? Many of our struggling readers need help with writing, too. Unfortunately, time is tight, and mClass assessments require written response! Here's a quick look at strategies that I use with my struggling second, third, and fourth grade readers to boost their written responses. The person doing the talking is the person doing the learning. Give tons of opportunities for your learners to construct meaning about text by talking about text throughout the day. When working in large groups, keep your struggling readers actively participating. A fast "turn and talk" gives the struggling reader the chance to practice verbalizing their thoughts. For a kinesthetic twist, try this free comprehension cootie catcher for your kiddos. Click here to download from my Teachers Pay Teachers store. This seems like a no-brainer, but it can take a shift in mindset. Listen to your struggling reader. Do they really speak in complete sentences, or are you (and their classmates) just "filling in the gaps?" If you don't hear complete sentences being spoken, you can't expect complete sentences in their writing. See the free cootie catcher activity above? Model and expect complete sentences for spoken answers. At this point students are talking about text and speaking in sentences. Let's tie it together while we practice finding proof! At this point, I want them practicing these with me in a small group so I can support and guide them through the expectations for finding proof using familiar trade books. 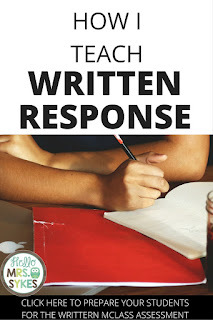 Since this approach has been so successful for my teachers and my students, I'm introducing my Written Comprehension set, called "Write About It!" We do one together, with multiple copies of the book when possible. To be honest, the first time we do this, we don't write anything down. Everything is verbal for a couple of days, with a lot of explanations of how they prove their answers. After we are proficient at answering the discussion questions, students can continue by writing their answers. To save paper, make enough copies for your small groups and use page protectors with dry erase pens. If you have handheld devices, you can use the included qr codes to refer back to the text. After I feel that students understand the expectations, they are ready to practice with a bit less scaffolding, until eventually, they are successful without the support you were providing before. Depending on the needs of your readers, you can practice these concepts in whole group, small group, and one-on-one settings to provide remediation in 3rd/4th grades, or even as enrichment in 1st/2nd grades. The set I've put together can easily be led by a volunteer or paraprofessional, as well as used as a literacy center or literacy station. Sorry for getting really salesperson-ish for a moment. I am just so excited to share this tool with teachers who are preparing for the mid-year written assessments like we are in NC. Feel like picking it up? Click here to view this set in my Teachers Pay Teachers store. Thanks for making it to the end of this post! Lots of love, and a reminder to be amazing today!